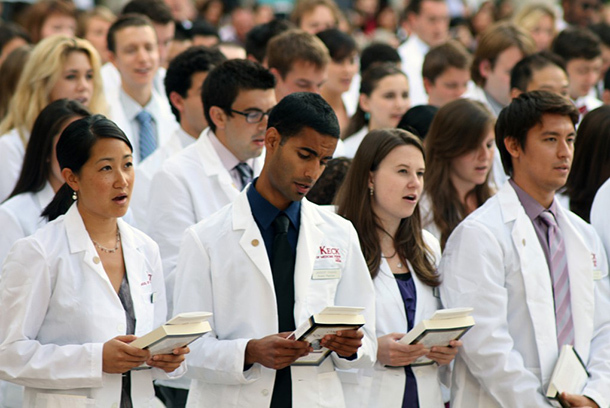 Keck School of Medicine students participate in the White Coat Ceremony on the lawn of the Eli and Edythe Broad CIRM Center for Regenerative Medicine and Stem Cell Research. Photo by Ricardo Carrasco. Founded in 1885, the Keck School of Medicine of USC is part of Keck Medicine of USC, a major center of medical research, education and patient care with more than 1,600 full-time faculty members and a voluntary faculty of more than 4,000 physicians. Included on the faculty are national leaders in each of its 26 clinical and basic science departments. Located on the university's 30.8-acre Health Sciences Campus three miles northeast of downtown Los Angeles, the Keck School is adjacent to the Los Angeles County+USC Medical Center, one of the largest teaching hospitals in the United States. The Keck School's faculty, students and residents serve more than one million patients each year through the Los Angeles County+USC Medical Center, the USC Norris Cancer Hospital, the Keck Hospital of USC, Children's Hospital Los Angeles, USC Verdugo Hills and a network of USC-affiliated hospitals throughout Southern California. More than 500 faculty physicians care for patients with complex medical needs as well as provide primary care. The Eli and Edythe Broad CIRM Center for Regenerative Medicine and Stem Cell Research of USC, which opened in the fall of 2010, joins the Harlyne J. Norris Cancer Research Tower and USC Zilkha Neurogenetic Institute in providing state-of-the-art facilities for important scientific discovery. With more than $248 million in total federal research support, the Keck School ranks among the top U.S. medical schools in federal funding. The Keck School of Medicine of USC is at the forefront of medical education and was among the first medical schools to adopt Introduction to Clinical Medicine courses for first-year students, providing direct experience in patient care from the start. The Keck School of Medicine of USC Committee on Admissions is responsible for selecting members of the entering class. The committee comprises both faculty and students. The committee reviews candidates whose academic achievement, commitment to service and personal qualities distinguish them from the many thousands of applicants who apply. The applicant's undergraduate major may be in any subject area from an accredited college or university. Although sound preparation in the basic sciences is essential, a background in the humanities, and depth and breadth of personal experience are also important. The Keck School of Medicine of USC participates in the centralized American Medical College Application Service (AMCAS) and also requires the submission of the Keck School of Medicine supplemental application. Approximately 8,000 applications are received per year and 750 applicants receive interview invitations. Interviews begin in late August and end in early March. Students receive acceptance letters beginning in October. All applicants to the Keck School of Medicine of USC MD degree program must have completed a baccalaureate degree, or its equivalent, from an accredited college or university prior to matriculation. The school has no specific course requirements. Strong applicants will have distinguished themselves in their chosen field of study and have demonstrated competency in the sciences at the time of their application. The Medical School Admission Requirement (MSAR) guide may be referenced for recommended course work. The Medical College Admissions Test (MCAT) is required, and scores must be from within the previous three years of the date of matriculation. International applicants must hold a degree considered equivalent to a U.S. bachelor's degree as evaluated by the USC Office of Graduate and International Admissions. Individuals who have discontinued studies in medical school for academic reasons are not eligible to apply to the Keck School of Medicine of USC. The MCAT is required of all applicants. Applicants to the entering class are required to take the MCAT within the previous three years of the date of matriculation and no later than August in the year that the application becomes available. Scores from administrations of the examination taken outside of this time period will not be accepted. The Keck School of Medicine of USC participates in the American Medical College Application Service (AMCAS). AMCAS reproduces and distributes an application and standardized academic record to participating medical schools designated by the student. Applications are submitted electronically at students/applying/amcas. Applications are available after June 1 for the class entering in August of the following year. Applications to USC must be returned to AMCAS by November 1, but earlier application is encouraged. The Admissions Committee reviews all information submitted on the AMCAS application as well as the school's supplemental application. The nonrefundable supplemental application fee is $100. Personal interviews are a required aspect of the application process. Interviews are conducted at the Keck School of Medicine on the Health Sciences Campus of the University of Southern California. Notices of acceptance will be sent to successful candidates beginning in October until the class is filled. Since Keck uses a rolling admissions process, it is highly recommended to submit a completed application early in the cycle. If not chosen for an interview, candidates are usually notified by March of the application year. Candidates must reply to an offer of admission and agree to the Essential Characteristics and Abilities Required for the Completion of the MD Degree within 10 business days of receiving the offer of admission. A letter of withdrawal, via email or post mail, is required if students wish to relinquish their place in the class; release is granted automatically when the letter is received. The Keck School of Medicine has developed an MD-PhD program designed for individuals who aspire to a career in academic medicine or a leadership role within the biomedical industry. Students are expected to acquire the modern skills that are required for physician competence. Additionally, the MD-PhD program provides an opportunity for the development of research expertise and academic excellence while fulfilling the requirements for a PhD degree. A joint program between the Keck School of Medicine and the California Institute of Technology (Caltech) was established in fall 1997 for the granting of the MD-PhD degree. PhD studies may be carried out at Caltech or through collaboration between two laboratories at both institutions. The MD will be awarded from the Keck School of Medicine and the PhD will be awarded from Caltech. The MD-PhD executive committee is responsible for selecting students for the MD-PhD program. Members of the committee review the qualifications of each applicant, including MCAT scores, academic performance, letters of recommendation and research experience. The committee interviews candidates and then selects students for admission to the program. All applicants to the joint program interview at Keck School of Medicine and the California Institute of Technology. The MD-PhD program enrolls a maximum of eight students annually. Students have the option of doing the PhD at USC or Caltech. Each student accepted to the program must also be accepted to the Keck School of Medicine. All positions are fully funded. Admission requirements for the MD-PhD program are those of one of the graduate programs at Caltech, the Keck School of Medicine and USC. Students select the program of their choice during the first two years of the medical curriculum; descriptions of these programs are available from each department or program and Caltech. To assist the MD-PhD Committee in its evaluation of candidates, applicants to the MD-PhD program are encouraged to provide recent GRE scores. The committee does not, however, require GRE scores in order to consider an application. Applicants to the Keck School of Medicine are advised to request information about the MD-PhD program at the time of application. In addition to completing the medical school application, applicants should indicate their interest in the MD-PhD program. Students who are currently pursuing the medical curriculum at the Keck School of Medicine may apply to the MD-PhD program by contacting: MD-PhD Program, Keck School of Medicine, 1975 Zonal Avenue (KAM 300), Los Angeles, CA 90089-9036; (323) 442-2965, FAX: (323) 442-0386. All applicants are screened by members of the MD-PhD Executive Committee; candidates who meet the basic criteria of the program are then invited to be interviewed by members of the committee and faculty at USC and Caltech. Students selected for acceptance to the MD-PhD program are notified between November and May of each year. Students begin their program in the fall semester and register for courses in the medical curriculum at that time. Further information about the MD-PhD program at the Keck School of Medicine may be obtained by contacting: MD-PhD Program, Keck School of Medicine, 1975 Zonal Avenue (KAM 300), Los Angeles, CA 90089-9036; (323) 442-2965, FAX: (323) 442-0386; email: mdphdpgm@usc.edu. Admission standards for these curricula are established jointly by the Keck School of Medicine, its participating programs and the Graduate School. Applicants to graduate degree programs offered at the Keck School of Medicine must meet the general criteria for acceptance to the Graduate School. Each participating program may have additional requirements for application. The programmatic requirements for the Keck School of Medicine's graduate programs are detailed in the Graduate Degree Programs section. Further information about graduate degree programs at the Keck School of Medicine may be obtained by contacting: Office of the Associate Dean for Graduate Studies, Keck School of Medicine, 1975 Zonal Avenue (KAM 409), Los Angeles, CA 90089-9023; (323) 442-1607, FAX: (323) 442-1199. The tuition and fees for the Doctor of Medicine (MD) program listed below are estimated for fall semester, 2018. All fees are subject to change without notice by action of the University of Southern California Board of Trustees. The university reserves the right to assess new fees or charges. Tuition is not refundable; late registration fees are mandatory and cannot be waived. Tuition for each semester of the medical school curriculum is due and payable at the beginning of the semester. Registration is not permitted after the third week of instruction. Late payment of tuition is subject to a mandatory late fee. Average budgets for medical students will vary according to their year in the curriculum. The Cost of Attendance for each year of the MD curriculum can be obtained through the Office of Financial Aid. Tuition and mandatory fees are the same for all years. Tuition for courses of the graduate curriculum is based upon the number of units assigned to each course. Late payment of tuition is subject to a mandatory late fee. Parking fee, per semester (see Tuition and Fees ). The Keck School of Medicine employs a system of evaluation and grading designed to encourage student self-reliance, to stimulate the student's independent quest for knowledge and to promote excellence in academic achievement. Grading and evaluation policies for graduate degree programs and for joint MD/PhD degrees are established in conjunction with the Graduate School. In general, courses taken in partial fulfillment of graduate degree requirements receive letter grades that are recorded by the university.